The writer has used a number of microphone rigs for 5.0 Surround in a variety of different acoustic spaces, and even out in the country side! There is a point of view that, as the human head’s hearing system is quite ‘coincident’, compared to the size of the sound sources in the acoustics we capture, is it not best to have a ‘coincident’ set of microphones to start with, and then the spaced out loudspeaker playback reproduction feeds what is captured, back to the ‘coincident’ human head hearing system. So having been the user of many different coincident Mid & Side mic rigs, over many years, it has been very easy to expand their use into the capture of 5.0 ‘Horizontal’ Surround, and then beyond! What ever rig is being used, it will be mixed ‘on the day’ for the Stereo, as one is usually being paid to be there for that! For the Surround, the mic feeds post the mics amps, are separately captured ‘raw’ on four or eight channel recorders. An Edirol R4 Pro (Pic. One), an Edirol R44 (Pic. 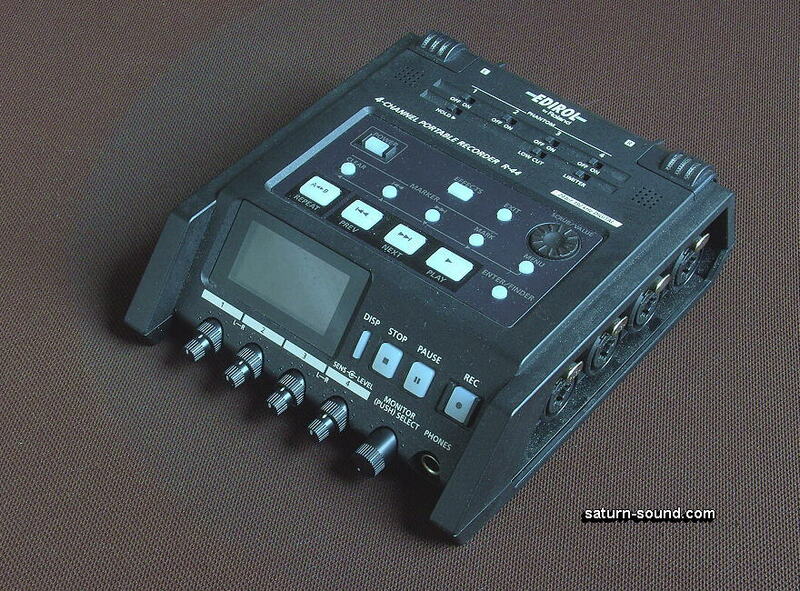 Two), or for up to eight channels, a Deva 5 and lately a Sound Devices 788T are involved, for the later Mastering for the Surround listening experience. Regarding the term 5.0 Surround, forget the 5.1 use of a special LFE Sub feed, for the Low Frequency Effects used in Film & TV. Any sub used for a recordings made in acoustic spaces, will just be involved in getting a fuller low frequency range from the Surround’s front L and R loudspeakers. 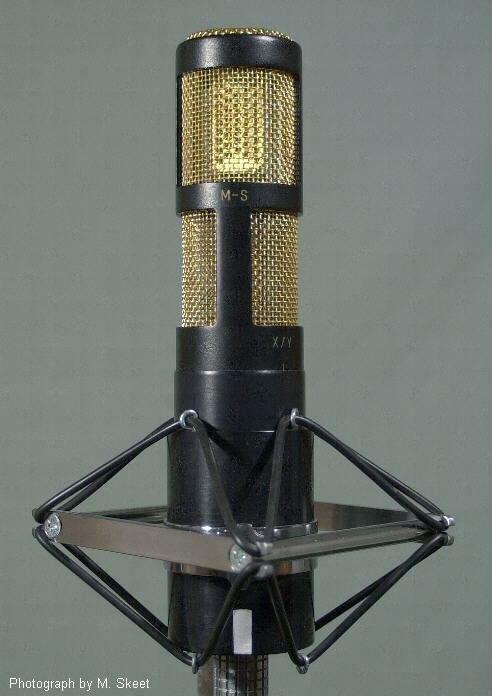 The W,X,Y,Z refers to the four B Format signals, that are cleverly created from four A Format signals provided by the tetrahedral array of four soft cardioid capsules inside the microphone body. You have an omni and three figure of eights, very coincident and symmetrical. W is the omni, X the fig. 8 front to back, Y the fig. 8 side to side and Z the fig. 8 up and down. For Horizontal Surround, the three W, X & Y signals can create a forward facing cardioid with W and X, and a rear facing cardioid with the W and a phase inverted X. Appropriately using Double M&S decoding (also known as MSM) you get the L & R Front Surround, Ls & Rs Rear Surround and use of the forward cardioid for the Centre channel. Pic. Four shows the use of three Schoeps CCM mics. There is a CCM2 omni (W) between a CCM8 front to back (X) and another CCM8 as the side facing Y. Pic. Five has a DPA 4006TL omni (W) between a Sennheiser MKH30 front to back (X) and another MKH30 side to side (Y). See Close-up (Pic. Six). As in the SoundField mic case above, initial mixing of the Omni and the Figure of Eights is needed to get the necessary forward and rear facing Cardioids. Especially with the CCM mics you have to allow for the different output levels of the CCM2 and the CCM8s. The DPA/Sennheiser rig levels are quite closely related. Using the Double M&S decoding covered earlier, you create the Front L & R Front, the Rear Ls and Rs with the forward facing Cardioid for the Centre. With physical cardioid mics directly involved, you avoid the need to mix an omni and a forward facing figure of eight to derive the two cardioids. 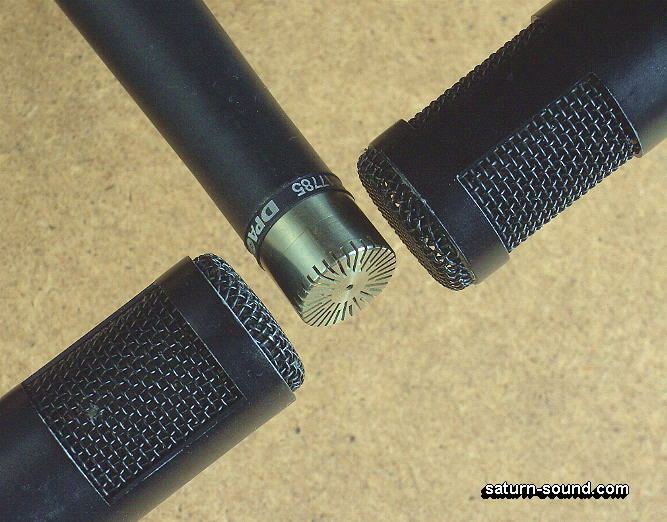 Any level differences, with different makes of mics, are more easily handled, as they will just directly affect the front and rear widths produced in the Double M&S decoding. Pic. Seven has the dual cardioid capsule MKH800 Twin and a MKH30 figure of eight for its Double M&S decoding. Pic. Eight involves a four rectangular capsule Pearl DS60 microphone. The microphone is orientated so that two of the capsules face front to back and the other two side to side. The two side to side pair of cardioids need to be mixed together initially, with the right hand facing one phase inverted, to create a figure of eight for the Double M&S decoding, using the front to back other pair of cardioids. A slight drift from ‘true coincident’ miking, a useful ‘specialist’ stereo miking system, is the use of two spaced apart M&S pairs of mics. Suppose you have a medium to large choir, and they cannot be arranged in a suitable semi circle for the use of a single stereo pair of mics, there is an alternative, which can also be used for 5.0 Surround! For the stereo you arrange the pair at around one third spacing in front of the straight line of the choir, at a distance suitable to the acoustics and balance etc. Very importantly, you angle each pair inwards to point at the front centre of the width of the choir. For the stereo, both pairs are decoded in the usual way, and the decoded signals mixed directly together. The variable width, available in each pair, needs to be appropriately set. The left hand pick up of the left hand placed pair, along with the right hand pick up of right hand place pair, will reproduce the choir’s stereo delivery very evenly across the soundstage, far better than having many pan potted mics spread across the front of the choir. The bonus is that 5.0 Surround is available! With the four laid down raw signals you can separately decode them and then assign them to the Surround feeds as follows. Feed the left of left placed pair to the Front Left, the right of the right placed pair to the Front Right, then there are a couple of alternative ways of feeding the Rear Ls and Rs. Due to the necessary angling in to the centre front of the choir, you could perhaps choose the right of the left place pair for the Rear Rs and then the left of the right place pair for the Rear Ls. The opposite of that could be tried and a decision as to the best made! The Centre feed is obtained by summing the two Mid mics of the rigs, as they are conveniently pointing at the Centre of the choir. 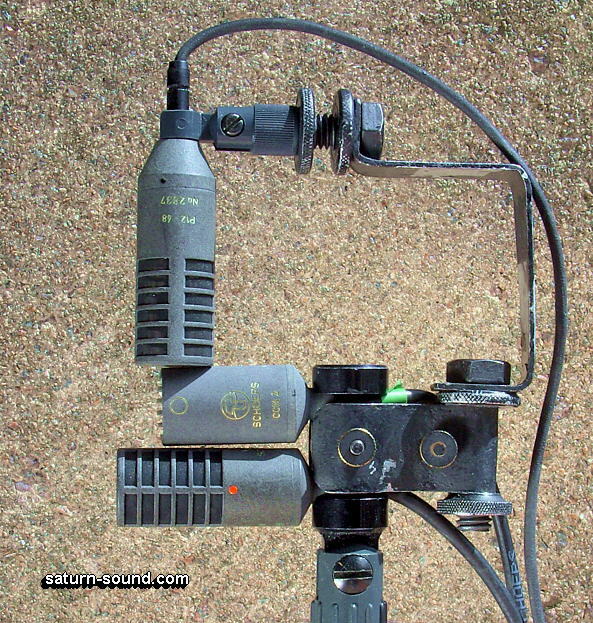 There are three Surround mic rigs possible using Omni mics, which do have so very little handling and wind noise interference compared to directional mics, especially figure of eights. Also, they are so easily wind-shielded, that it is not really worth trying any of the other rigs discussed, except the SoundField with its soft cardioids, and which can also be successfully wind shielded. There is the Canadian Holophone with five omnis as an ellipsoidal array . There is also a LFE feed, derived internally. Windshielding is available for outdoor use. The stereo with loudspeaker playback works very well. This is mainly by making sure the two mics in use do ‘see’ the centre soundstage by tapering and curving the surface, compared to having them just pointing out to each side of the head, as is done on early commercial Dummy Heads. The addition of three more omnis for the Surround effectively takes things forward. 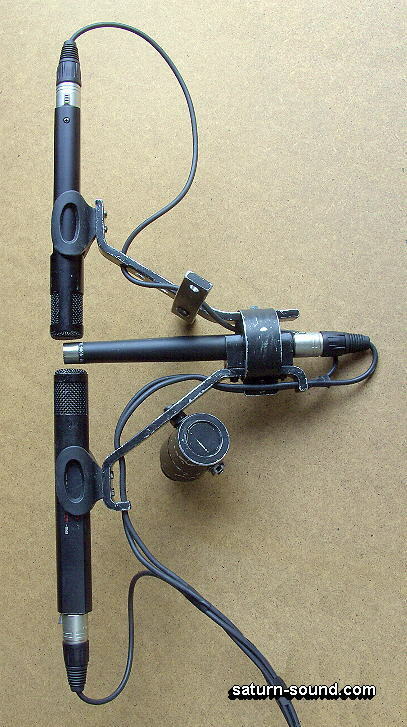 The Rear CCM2 mics are at the back of the head, with the Centre one at the front, between the L and R main mics. 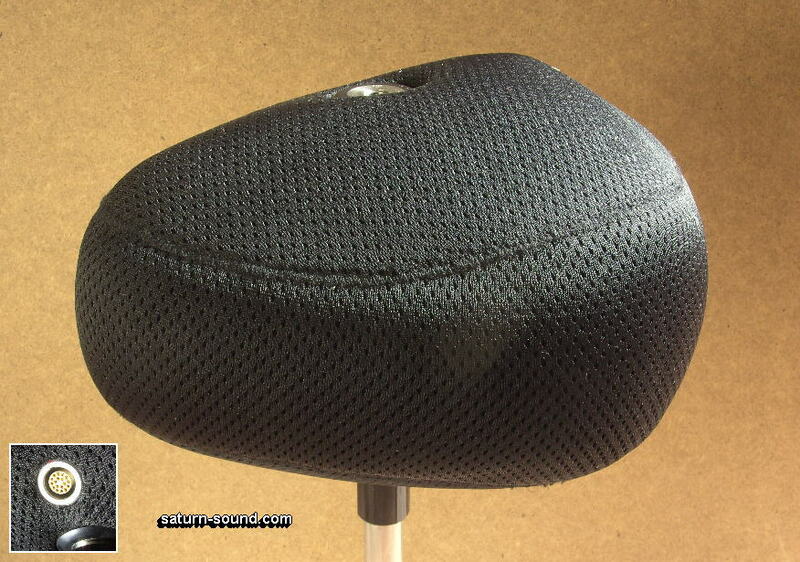 Effective windshielding using flour sieves and ladies tights was also created. Pic. Ten..
Pic. 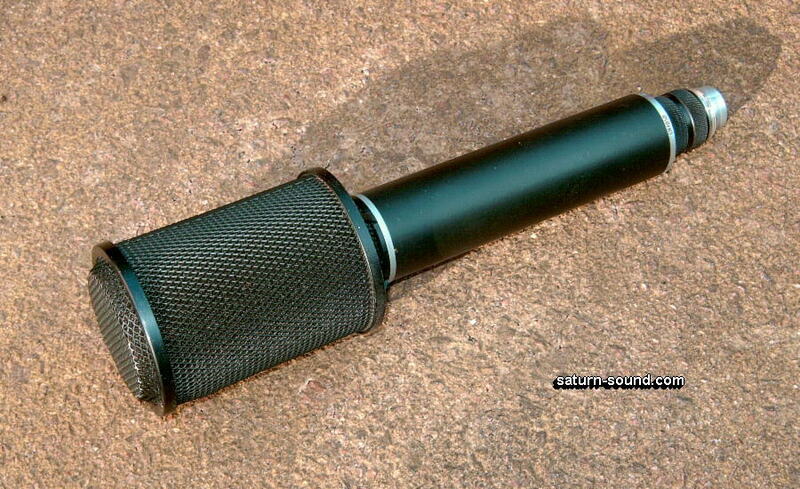 Eleven is of the recently introduced DPA 5100 Surround Microphone. This is a novel lightweight, thoroughly wind shielded unit with no handling problems. Five omni mics are in the expected places. The front L, C & R are made a little directional, by short Interference Tubes, with the mic capsules actually very coincidently placed towards the internal rear of the unit. The Ls and Rs capsules are flush mounted at the rear of the unit. 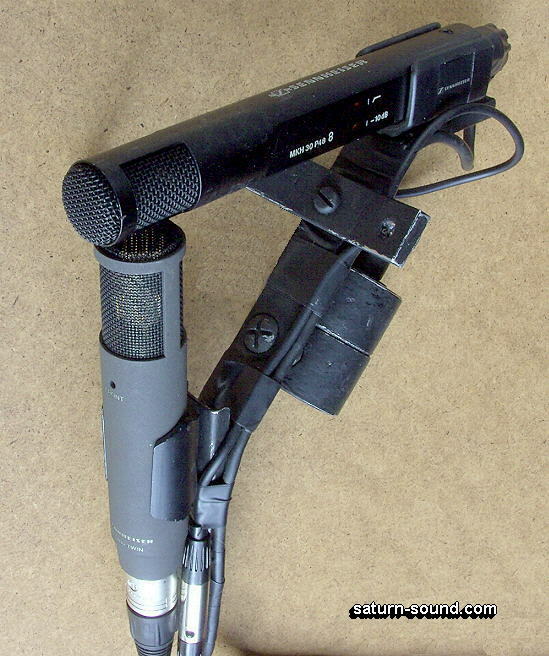 There is a LFE output available, derived from all the mics. Apart from capturing Surround in acoustic spaces, the writer has used the DPA5100 for some outdoor Brass Band recordings at Village Fetes. 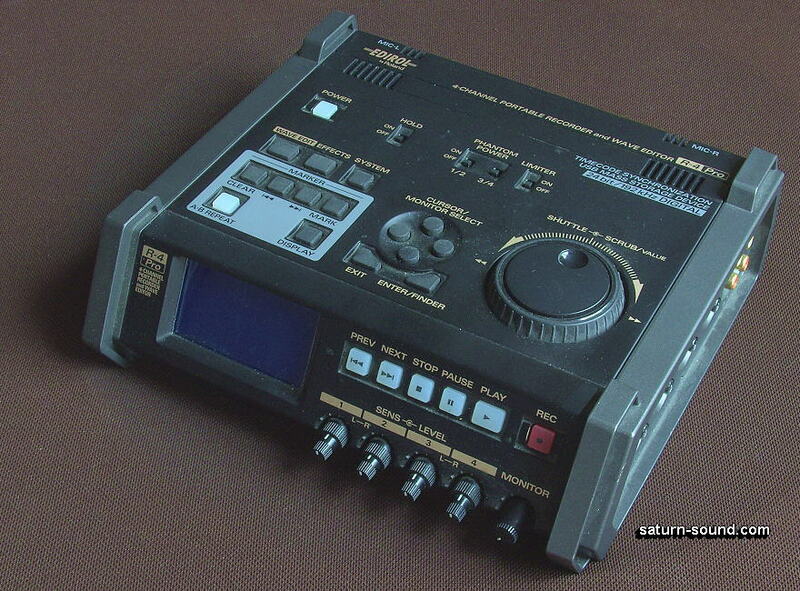 The mix down to stereo for CD use is very good indeed – with the Centre and Rears reduced in level to that mix. The 5.0 Surround results have really impressed a number of listeners and certainly adds ‘realism’ compared to the stereo version. 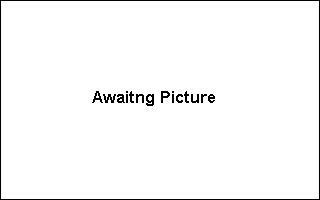 There is an addition to horizontal Surround possible with some of the rigs mentioned. In lots of recording spaces like churches, the live Surround effect is not only in a horizontal plane. Also, fireworks and aircraft display recordings are surely missing something. Paper No.4 will cover the capture of the Missing Height in Surround recording, with additions to some of the above rigs and the practical way of reproducing it.